Are You Having Your Windows Replaced? Find out How You Can Save with DunRite! You Won't Want to Miss Our Special Buy One Get One Free Window Offer! Our Spring BOGO Window Sale! 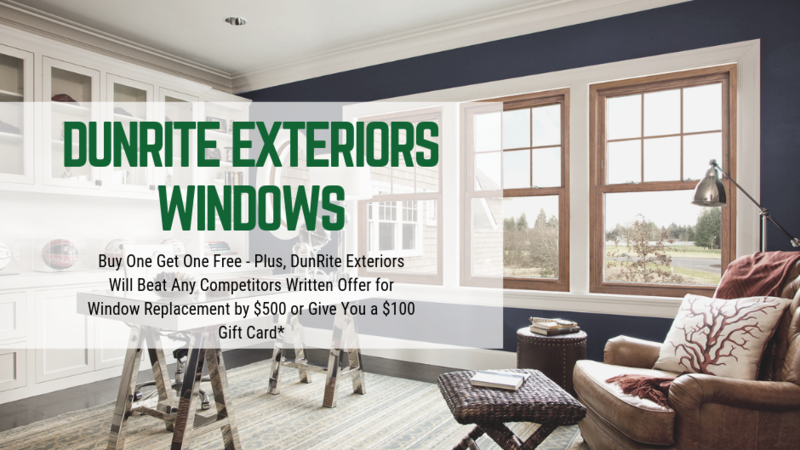 Now Through The End Of April, buy one DunRite Exteriors Window and get one FREE. PLUS, we'll beat any competitors written offer for window replacement by $500 or we will give you a $100 Gift Card. * Get rid of those cold, drafty old windows and save money on your energy bills. DunRite Exteriors Windows have the Exclusive Intercept Warm-Edge Spacer which is 25% more effective than traditional metal spacers. If you would like to learn more about all of our available window options, please click here. What Can You Expect from Our Integrity Window Series? Make a bold statement with elegant double-hung windows. The combination of an extremely simple-to-use design with a stylish, contemporary look makes the DunRite Integrity Series the right choice for homeowners who pay attention to the smallest details, and expect perfection every single time. Fusion-welded sash and mainframe structure for added strength and rigidity. Multi-walled extrusions with airtight insulating chambers enhance thermal efficiency and durability. Interlock at sash meeting rails helps block air infiltration for added comfort and insulation. Low-profile sloped sill forces water to rain to the exterior of the window. Coved contoured glazing bead provides a neat finished look. Block and tackle balance system for smooth, comfortable fingertip operation.